In some parts of the world, it is starting to cool off, as summer gives way to fall. Fall signals the time to dust of the soup, stew, and chili recipes, and start enjoying those comforting, warming, delicious bowls of brothy goodness. One of my favorites is gumbo, in all of its varieties. Gumbo is great to make on a Sunday night to leave in the fridge until Monday night. I make several different gumbos, that all play off of the same base. which is a combination of the Creole and Cajun styles. 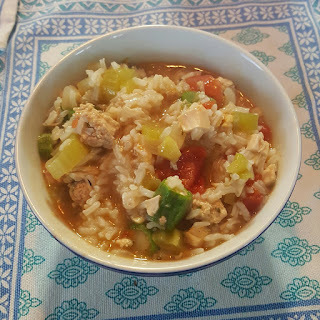 Today I am sharing a recipe for a Chicken and Crawfish Gumbo. This particular gumbo was one we threw together based off of ingredients we had in the fridge and freezer. In a heavy bottom pot, I prefer a porcelain enameled cast iron dutch oven, brown the sliced sausage over medium heat. I like to use a kielbasa style sausage or a beef or pork sausage. Once browned, remove the sausage to a bowl for later. Add some olive oil and the bell pepper, celery, onion, and garlic. The Cajuns call this the holy trinity. While the holy trinity is sautéing, melt the butter in a small cast iron pan over low heat. Stir in the flour. This is going to make the roux to thicken the gumbo. Don't rush this process. It can burn very easily. 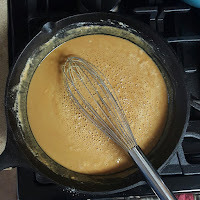 I like to get the roux to at least a golden brown, but it's even better at a dark walnut. Back to the holy trinity. Keep stirring it while the roux is going. When the onions start to brown, add in the okra, chicken, broth, bay leaves, and stewed tomatoes. Remember the sausage waiting in the bowl? Time to add it back in too. Bring everything to a simmer. Now is the time to season with salt and pepper. If the gumbo cooks too long, the seasoning won't be absorbed and will sit on top of the rest of the flavors. Season to taste. By now, the roux should be ready. Add it to the pot. Keep the gumbo simmering. To qualify as gumbo, it has to cook for at least three hours, if not longer. The crawfish tails are going to cook quickly. If they cook too quick they will turn rubbery and chewy, which is not something anybody wants to find in their food. Put the crawfish tails in right before serving. They just need to warm up and will cook through in a few minutes. The okra will act as thickening agent, but I grew up adding filé powder to my gumbo in addition to the okra. It is optional. Serve the gumbo over rice. I like my gumbo spicy. Hot sauce is key here. Tabasco. Cholula. Lousiana. It really depends on what I have in the pantry and how I feel. It goes great with buttered French bread. Gumbo is like jambalaya. A recipe can exist, but it is forever evolving. It typically doesn't taste the same each time and I always find new ways to make it or new flavor profiles to get out of it. I look forward to hearing how yours turns out.